Amy Hodgepodge - All Mixed Up! Amy Hodges is excited to start fourth grade at a 'real' school after years of being home schooled. On Amy’s first day, she gets teased not only because she is new, but also because she looks different. Amy is part Asian, Caucasian, and African American. Eventually Amy meets a group of friendly kids and discovers she is not the only one in school who is part of an interracial family. 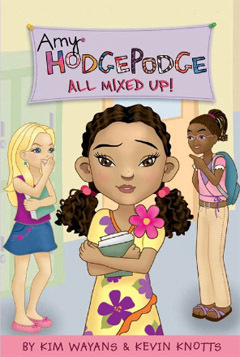 One of her new friends affectionately gives her the nickname 'Amy Hodgepodge' since she is a mix of so many races. However, when the kids’ teacher announces that the annual talent show is coming up, Amy wonders if her new friends will want to include her, too. Amy Hodgepodge - All Mixed Up! is aimed at six to ten year-olds and is a good companion for children who are finding their way through the maze of school relationships. The first in a series, Amy hodgepodge - All Mixed Up! 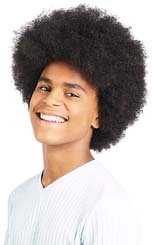 gives a face and a voice to mixed-race children and the everyday challenges they encounter. Children of all races will identify with this series since it deals with universal themes such as feeling 'different', being teased, and making new friends. Complete with black-and-white illustrations by Soo Jeong, the Amy Hodgepodge series is the collaborative work of Comedy entertainer Kim Wayans and her writer husband, Kevin Knotts. The racially mixed couple were inspired by their many mixed-race nieces and nephews. Amy Hodgepodge - All Mixed Up! by Kim Wayans & Kevin Knotts and the second book in the series Happy birthday To Me are available to buy from May 2008.